One word that is often used in domestic violence circles is the term “gaslighting.” It refers to a commonly used emotional abuse strategy with the aim of making the victim question her own perception, experience, judgement, sanity (see definitions here and here). 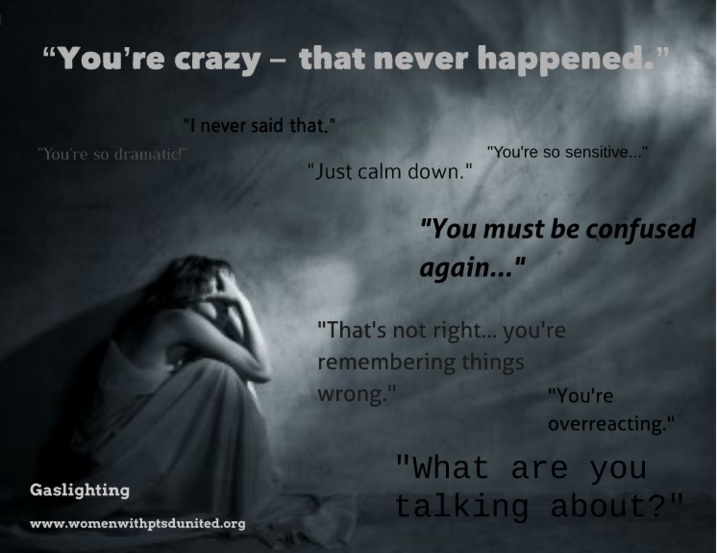 During my counseling sessions with domestic violence victims, many will tell me that they feel or felt “crazy” in response to the way the abuser has treated them (which has almost always included gaslighting). Telling the victim that a recent verbal or physical assault simply did not happen (“you’re remembering that wrong” or “I never said/did that” or “that’s not what happened”). Hiding something important to the victim (like keys or medication), allowing her to tear the house apart looking for it, then putting it back in its original place (without telling her) and insisting it was there all along. Repeatedly telling the victim something about herself that is not true until she eventually begins to question herself or believe the lie (convincing her that she has a mental health disorder, that she doesn’t do anything right or doesn’t do certain things right, etc). Constantly changing the “rules” (one day insisting that clothing be folded and put up one way, then insisting the opposite the following day…and denying whatever was said before…and lashing out each time it is done “wrong”). Manipulating a known concern or struggle (when a victim with a mood disorder becomes upset about the abuser’s behavior, convincing her that she is having a mental health “episode” or is overreacting because of her disorder). Most of us would reject this type of thing the first time it happens. But over time (especially when coupled with the deliberate attempts to isolate victims that are also key to domestic violence) when you hear something often enough, you start to wonder. You start to question yourself. You become preoccupied trying to figure it all out. Trying to do things “right” and to keep the peace and to prove yourself. And the abuser’s power increases. Understanding how gaslighting works and how abusers use it may help us to better walk with survivors as they begin to unravel the impact of gaslighting in their lives and the toll it has taken on their mental & emotional well-being. It is truly a form of torture. And is often a very effective strategy for preventing domestic violence victims from trying to leave the relationship. And doing all of this with a straight face and becoming angry at anyone who dares to question. Gaslighting is all about continuously pushing the limits of what the abusive person (or system) can get away with. It’s what often makes individual domestic violence victims feel they are constantly walking on eggshells. We have to be alert and vigilant about recognizing, confronting, and resisting gaslighting at the national level. Otherwise, it will continue to confuse, to turn us against each other, to blind us from what is really happening. That’s the whole point. The “leader” of this country is trying to get us to question everyone and everything except him. And is pairing that with all types of intimidation directed at anyone that might oppose him. One of the greatest antidotes to gaslighting is not being isolated. For an individual victim, having access to relationships with supportive people who can challenge the lies and manipulation can help that victim to remain a sense of sanity and to increase their sense of empowerment. Nationally, this means a few things. It means diversifying our sources of information and news (and considering who is funding our “news” providers). It means having genuine relationships with a diverse group of people and making sure that your circle is not limited to people who look, think, act, believe, vote just like you. It means having a support network that is also willing to speak to and against oppression…being part of some type of community fighting for justice. It means being willing to engage in difficult and challenging questions & conversations. It means studying history and using critical thinking skills as we do so…resisting many of the past and present narratives about American Exceptionalism when our collective past and present behaviors have been far from exceptional (especially for those of us with privilege – male privilege, white privilege, economic privilege, etc). Another strategy for resisting the impact of gaslighting is to consider behaviors much more than words. I frequently encourage my counseling clients to give more weight to the abuser’s behaviors (and behavioral patterns) than to his words. Actions really do speak louder than words and this is especially true when it comes to gaslighting. Whether we’re talking about Trump or domestic violence perpetrator, it’s what they do and the impact of those actions that really matter – not their promises, public statements, alleged motivations, or alternative facts. For more information about what gaslighting looks like, check out this great Psychology Today article. What other examples of gaslighting are you seeing on the national level & how else might we resist? Share in the comments!